When working with projects that involve wood or steel, there are certain times where you need to ensure you have a true and straight hole drilled. There is nothing worse than when you attempt to join two pieces together using a straight rod, only to find out that the holes are not perfectly aligned. This can even happen when you are using clamps to hold two pieces together and you use a handheld drill. The best way to drill perfect holes into the wood or steel you are using is to use a Drill Press. A drill press is a great tool to ensure the integrity of all of your projects. However, how do you decide what is the Best Drill Press for you and your needs? Within this buying guide, we’ll cover some of the key components to what makes a great drill press. After that, we’ll show you some of the best Drill Presses within the industry currently, as well as offering reviews and a comparison table, which will hopefully make your decision easier to make concerning which one is best for you and your needs. While looking at Drill Presses, you would think that each one does the same thing, right? You line up the piece of wood or steel, you mark where you want to drill it, and then you put that piece into position and pull the drill down on that mark and create the hole. Not very complicated, right? However, there are various options which are available to any drill press, which can either help or possibly hinder your project. The first thing you need to look at within each drill press is the configuration of the speed that it offers. How fast the drill can go can determine what kind of material you can drill easily and effectively. The speed is determined by the RPM’s, or the Rotations per Minute. The standard among drill presses is to have five adjustable speeds, which are a standard of low, low medium, medium, high medium and high. The lower the drill speed, the cleaner the hole will drill; and in contrast, the higher the speed, the more splintered your piece of wood or metal will become. The average drill press will have an RPM speed which ranges between 500 RPM’s and 3,100 RPM’s. After you look at the speed possibilities of each drill press, then you have to look at what are different types of drill presses available to you. There are many different types of drill presses available, but we’re going to focus on the two most popular types, which are Benchtop and Floor drill presses. 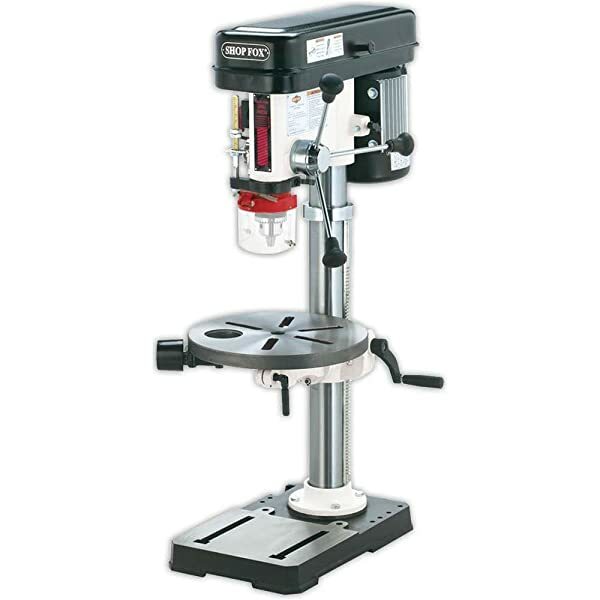 A benchtop drill press is a smaller version of the drill press and is an upright drill. This type of drill is best for light to a medium drill press, which is great for the normal household projects you have. The main thing you need to look for with this drill press is the stability of the base, as it does need to sit on a solid surface in order to be effective. It should not be on the floor, but rather should sit on some form of a sawhorse and base that sits on those sawhorses. If you have a bench, then this kind of drill press would sit on your bench well also. There is also a Floor drill press, which is known for being able to perform projects which are between light and heavy duty. This drill press will allow you to hand feed projects, or to automatically feed the drill press. It does sit on the floor, which makes it very stable; you need to ensure the table is adjustable, so you can adjust the height of the table to ensure you can operate it safely and securely. Lastly, each drill press comes with a feature which does separate it from the rest of the presses within the marketplace. Some drill presses will come with a laser beam to give you a more accurate idea of where your drill bit will hit the piece of material. Some will come with the ability to adjust the angle of the drill bit up anywhere between 45 and 90 degrees, so you can create an angle drill. Some will come with a light, to better illuminate the work area you are working within. Lastly, the material the table is made from can have a lasting effect upon how durable the table and drill press will be. This Benchtop Drill Press from WEN does have five variable speeds, which range in RPM’s from 740 up to 3140. The motor is a 1/3 HP, giving you the necessary power to complete any low to medium size project. The table for the drill press is 6 ½” square, which will give you the necessary room to hold your project on the table securely and stable. You can adjust the depth of the of the drill bit into the material by up to 2″; you can also lock that depth into place, so you can ensure that you have the same depth for every pulls down. This allows you to make sure you have the same drill settings for every drill into each material you have. The drill has a few setting which is very easy to change, as they give you the chuck key so you can change the drill bits easily and fluidly. The base of the drill press is made from a cast iron material, which gives you a very durable table to operate from. The drill can also give you a bevel drill into the material which can go up to 45 degrees. You can set the exact angle you want for each drill bit, so you can make sure you have the same drill process into each material, no matter what angle you desire for your project. 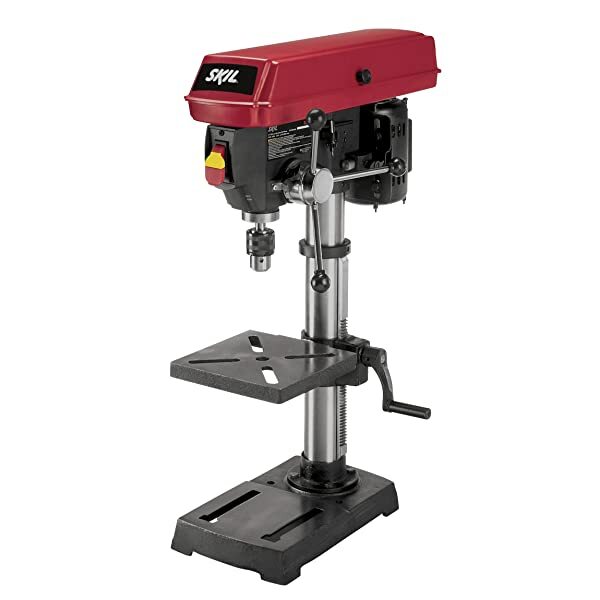 Skil offers up this benchtop drill press for you to review. This press has a 10″ table, which gives you plenty of room to work with in order to ensure your material can fit on the table as it needs to in order to drill it properly. This drill press comes with five adjustable speeds, with a range between 570 RPM’s up to 3,050 RPM’s. The adjustable speed will allow you to ensure you can get the proper amount of drill speed necessary to create the hole needed to complete each project. You can adjust the height of the table so you can set the depth of the drill bit correctly, in case you don’t need to drill all the way thru the material. The table can also adjust, so you can drill at an angle that is up to 45 degrees. This is very beneficial in case you need to create an angle within your project to help secure them together more tightly than a straight on an angle can provide. The drill bit area is guided by a laser beam, so you can ensure the drill bit will go exactly where you want without having to guess and make an error by dropping the bit in the wrong place. This Benchtop Drill Press from Shop Fox comes with a 13″ circular table, which gives you a unique look compared to the square tables you typically find. This table also does turn 360 degrees, so you can swing the material around as needed to give you the desired accuracy. 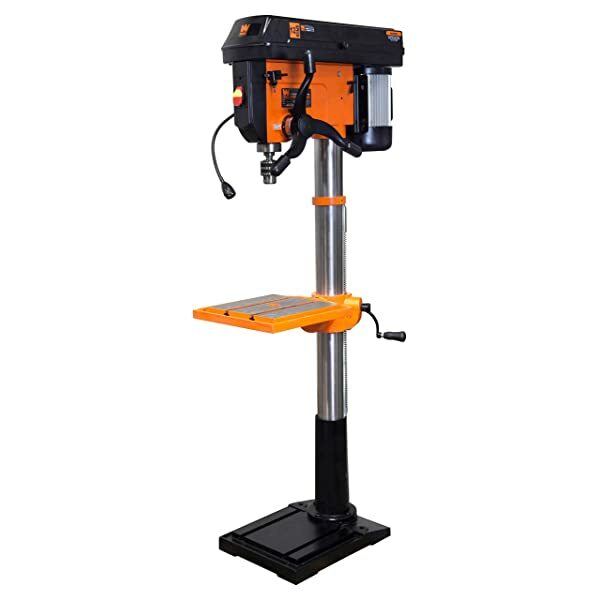 The motor for this drill press is a ¾ HP, which will provide you all the power necessary to complete any household projects which are low to mid-level. This drill press comes with 12 adjustable speeds, which range from a very slow 250 RPM’s up to a very quick 3,050 RPM’s. This wide swath of speeds will ensure you have the right speed to complete every project you need to be completed. You will also get an easy to use drill chuck, which will allow you to change out the drill bits with ease. The unique thing you will receive with this drill press is the ability to have an oscillating sanding operation with this drill press. The sanding drums can range from 1″, 1 ½” and 2″, and you can use any grit rolls with this drill press. The sanding drums can also use the adjustable speeds that you can use for a drill, which is a great component to utilize for any wood working project. On this floor drill press, it comes standard with a cross-hair laser formation, so you can ensure you will see exactly where the drill bit will come down into the material you are drilling into. Along with this, you can easily change the speed of which the drill operates, so you can operate this power tool with efficiency. This floor drill comes standard with 16 different speeds, so you are sure to find the one you need to complete your project. You can drop the drill bit up to 6″ into the material you are drilling, which gives you a lot of options concerning the type of material you can drill into. There is an adjustment lock on this drill press, so you can properly set the depth you want to drill into your material, allowing you to quickly and easily drill numerous pieces as needed. 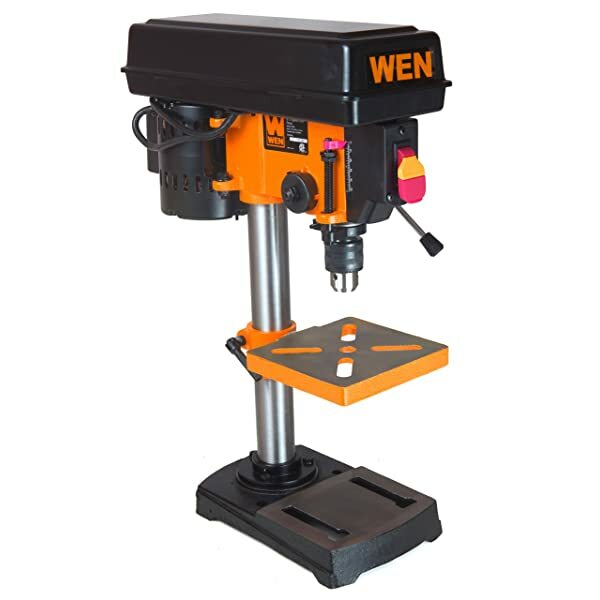 The Floor Drill Press from Wen comes with a 14″ Cast Iron Table, which has an adjustable table so you can drill angles which are between 0 and 45 degrees. The spindle of the drill press can dive to a depth of 4 ¾”, which allows you to easily drill any material that is 4″ or narrower. This floor drill press comes with 12 different speed adjustments, and the speeds can vary between 180 and 2940 RPM’s. You will see a laser beam coming down into the material you are drilling, so you can ensure you get the right drill spot the first time. You can install drill bits which range anywhere from 1/8″ to 5/8″. 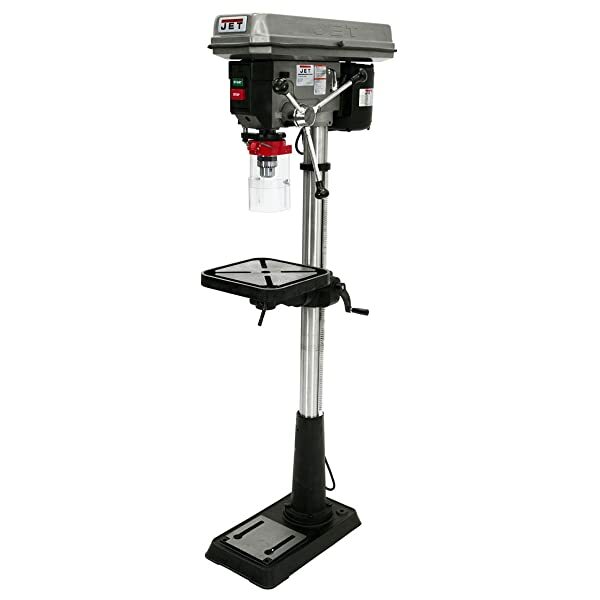 Due to the size and the speed variables with this drill press, you can drill into a large variety of materials, including wood, plastic, and metal. The table also comes with a 1″ cooling channel, which will ensure both the Drill Press and the materials you are working with to stay cool, so they don’t overheat. The table on this Floor Drill Press can tilt up to a 45-degree angle, allowing you to drill into any necessary material for the desired angle. The head of the drill press is made out of a cast-iron material, meaning it is durable and long lasting. The motor of this floor drill press comes equipped with a 3/4 HP, and the head of the drill press can hold up to a 5/8″ drill bit. This drill press comes with 16 speeds, which has a range of 200 up to 3,630 RPM’s. The table for the drill press is 7″ x 7 ½”, allowing you to hold large pieces of materials. The spindle of the drill can lower down 3 3/8″, allowing you to drill materials which are 3″ in depth or less. The unit comes with an easy to use power on and power off button along the front of the unit. You will also receive the 5/8″ chuck in order to easily change out the drill bits so you can easily and effectively use this power tool during its use. 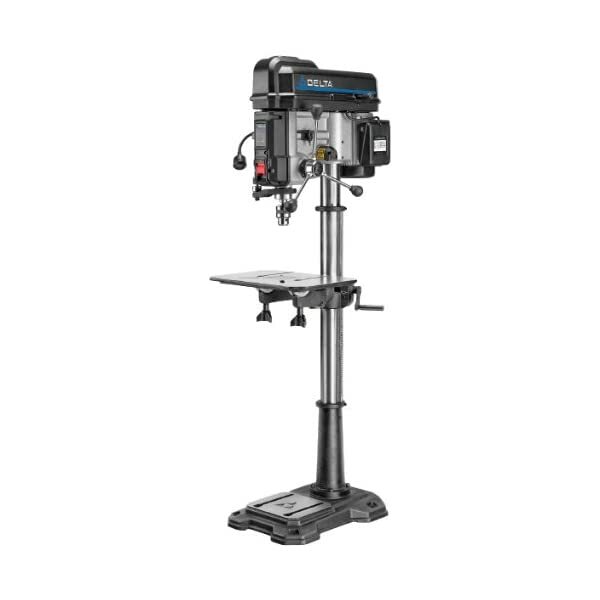 Table Size 18" 14" 15"
Once you have decided that it’s time to get a drill press, you have a variety of choices to decide between in order to ensure you have the best solution for your project needs. The Benchtop Drill Presses are easier to store and manage but may be harder to manipulate due to not being able to easily adjust the height of the table base. The Floor Standing drill press is easier to use, but it takes up more storage space. Depending on how often you use a drill press will determine which type of drill press you should purchase. Once you decide upon that, then you just need to see which one has the best features for the best price, and then you can make your decision. After you have chosen, please feel free to reach out to us and let us know which one you chose and how well it works for you. Thanks for reading, and have a great day!